A new 'midi'-format edition of internationally renowned designer Orla Kiely's bestselling guide to pattern. Illustrated with fabulous images from Vogue's archive, Vogue: The Gown is the ultimate visual sourcebook for all those who love fashion. The definitive origin story of the God-King Sigmar in a collected omnibus edition. 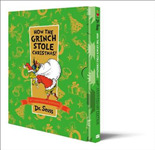 Have the best Christmas ever with the one and only Grinch from the iconic Dr. Seuss! This exclusive and very collectible slipcase edition comes with a special introduction all about your favourite Christmas character! A stunningly illustrated picture book full of mystery and suspense, from the bestselling author of THE STORM WHALE and GRANDAD'S ISLAND. The "fifth season" saga of the Star Trek: Enterprise TV series continues with this action-packed original novel from the bestselling author.